Love that splash of red on the blue - fab colour combo and such a clean, crisp and beautiful card. 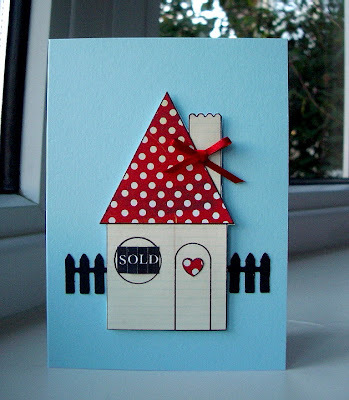 Lovely card and I really like your little house. That dotty roof is just fabulous. Hope you're enjoying the Polka Doodling too. I also notice you're part of Funky Hand which probably means that you know Chris (Craftling) who's a very good friend of mine. Small world isn't it! loveit, huge fan of all things polka dot so will be joining in with bells on!! Except no bells as that would be too much like Christmas! Love this Dolly, lovely design and I love the sold sign too! !